Ok, so I'm already married. But I did make the wedding dress I'm wearing in the pictures even if I didn't actually get married myself in it. 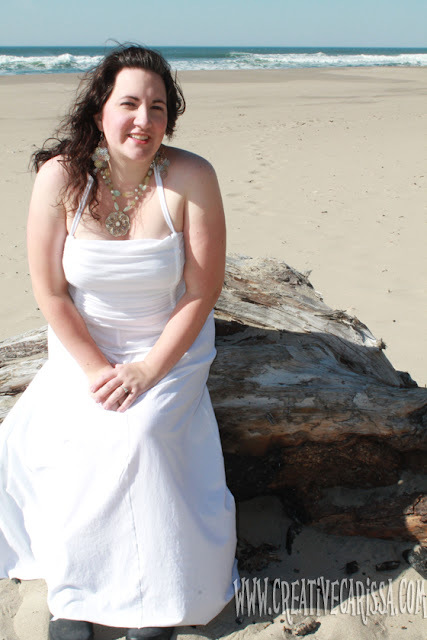 My husband and I took some time to get away to the Oregon Coast as a bit of a second honeymoon/family vacation and I wanted a pretty dress to wear on the beach commemorating us re-choosing each other. Seems pretty simple. I am not a great seamstress by any stretch but I figured I could probably pull this off. I wasn't able to find a six pack of white shirts but I did find a five pack of 3XL shirts for $13.69 and I picked up a spool for white thread for $1. I wasn't a huge fan of the hanging bit in front on the inspiration dress so figured I'd just do without it and could pull it off with only five shirts. I decided I liked how the back fell and made a bit of a train. I still followed the instructions about marking the pin line (I used a purple disappearing marker) but did NOT cut off the extra fabric. 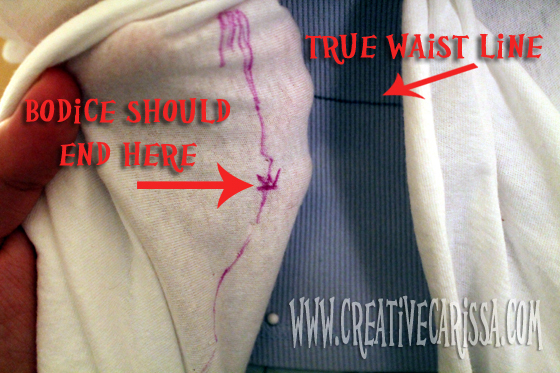 When it was time to work on the wrapped part of the bodice, we ran into an issue. I am about a size 16 - and my bust is probably twice as big around as the model's. In the video, Corinne wraps the fifth piece of fabric around the model twice with enough leftover to tie a knot. I barely had enough to wrap around once and tie a knot. 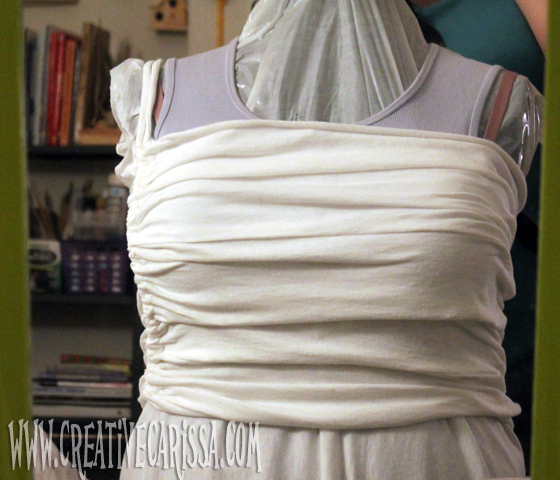 I had all the material from the tops of the shirts left and figured I could use that to make a cool ruched top. And this is where I diverted from the ThreadBanger tute. Cut straight across the front right under the collar and straight across the back right under where the printed tag is. Split the pieces up into sets of two. 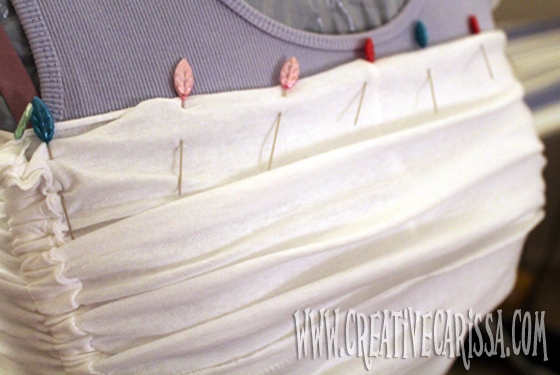 Pin them right sides together on the short side and sew to make three strips with a seam in the middle. Now, matching up the seams, match right sides together and sew them down the long sides. Iron the pieces, pressing seams in the same direction. Trim off any extra material from the edges or seams. Now we need to make channels for the straps to run through in order to gather the material for the bodice. To make sure the opening stayed large enough for the drawstrings, I used a dowel as my guide. I laid it on the seam that runs through all three pieces and then folded the material over and stitched as close to the dowel as I could get (I slid the dowel along as I went). Then I folded the little pocket I made down onto the main part of the fabric and stitched really close to the fold to make two channels (on the right you can see there is a dowel in each channel). 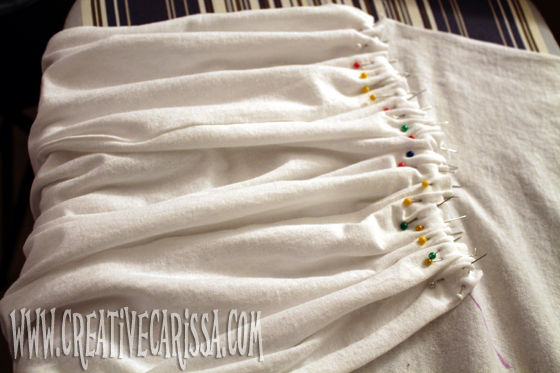 Now join the ends of the fabric strip (the short ends) and sew together to make a big loop. To make the strap (which will also be used for ruching), cut across one of the strips leftover from the bottom of the tshirt. Then use a safety pin to turn the strip inside out, making a long tube. Using the safety pin, thread the strap down one of the ruching channels and then back up the other one. Try the bodice on your dress form over the dress base (ignore the blue bit and the pink straps there...they're just part of my semi-DIY dress form). Gather the material, arranging it as you like it. I originally thought I would just gather one side but decided I wanted to do the other side, too. If you want to do the other side, mark the placement with a pin and then sew another set of 2 channels as before then thread the ends of the strap through. Sew the ends of the strap together once they are threaded through the second set of channels. 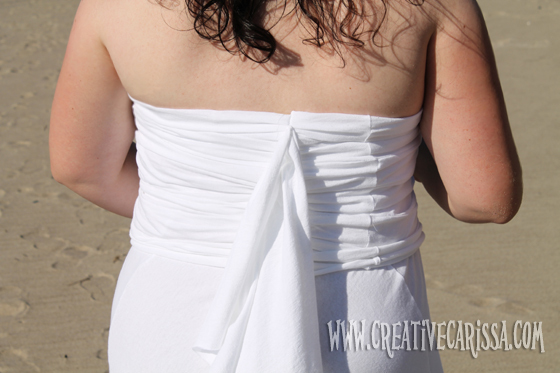 Once you have your channels finished and threaded, put the main body of your dress on the form inside out. Put the top back on the dress form inside out being careful to place the channels where you want them to go and keep the straps in between the bodice and dress. Pin around the dress until you get to the center back. Cut the bodice up the center. So the you can sew the bodice back where it belongs, mark the pin line you already marked on the body with an X where you want the bottom of the bodice to be. Sew around the top using a zigzag stitch, skipping the opening of the channels where the straps are to leave them free moving. 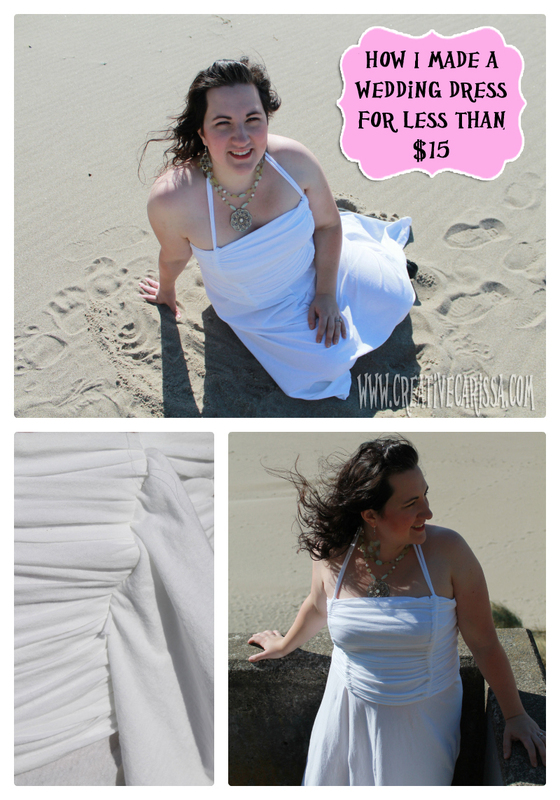 Once you're done, flip the dress right sides out. First we have to pin the back of the bodice down where it belongs. To help gauge where to pin down the bodice along the center back seam, I first pinned the bottom edge to the X I made above. Then put dots down the line to divide the section in thirds. I gathered each bodice section between the seams and then pinned it down along the line between the dots. Do this on both sides. 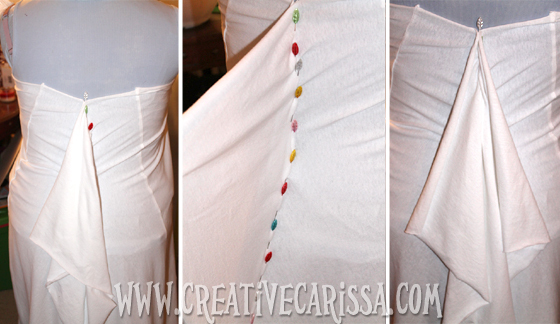 Now pin the dress back together along the purple pin line you drew earlier and sew along line with wrong sides together. I could get away with doing it this way because I stopped sewing where the tail/train ended and so when it falls on the finished garment, it covers the stitching. If you were to want to sew beyond the train, you may need to flip the part below the train in and sew them right sides together. A big thanks to ThreadBanger for the inspiration and tutorial. Hopefully this will help you if you have some curves but are still looking to make an inexpensive wedding dress that works for you. This is beautiful! I am going to try this.